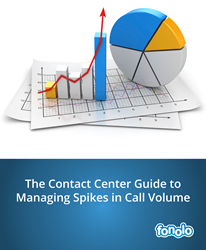 Fonolo Releases "The Contact Center Guide to Managing Spikes in Call Volume"
This whitepaper serves as a handbook for contact center managers who want to prevent spikes in call volume. We hope it helps them find a simple solution for reducing the burden of long hold times. Fonolo, the pioneer in cloud-based call-back solutions for the contact center, has released a free whitepaper for call center professionals, “The Contact Center Guide to Managing Spikes in Call Volume.” This report outlines approaches for handling unexpected spikes in call volume, and strategies for ensuring that the customer experience is unaffected. As reported by Parature, voice continues to be the most preferred channel for customers, but its popularity comes at a price: long hold times. These lengthy wait times are caused by two key factors: call volume spikes and understaffed contact centers. The effect they have on the customer experience is significant: 60% of customers will abandon a call after just one minute of waiting on hold. The report further explores the ROI of call-backs and explores important questions that contact center managers should consider when implementing a call-back solution. “This whitepaper serves as a handbook for contact center managers who want to prevent spikes in call volume. We hope it helps them find a simple solution for reducing the burden of long hold times,” said Fonolo’s Director of Marketing, Daniela Puzzo. This report is a must read for anyone seeking to improve the performance of their call center in 2016. To download a complimentary copy visit “The Contact Center Guide to Managing Spikes in Call Volume”.